Call (727) 209-0900 now to learn more! 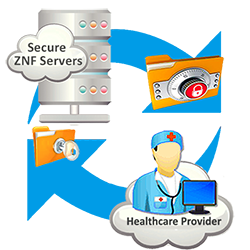 ZNF can import your completed medical transcription directly into your EMR or EHR. Minimize the data-entry burden on your clinicians. Ensure fast and accurate documentation of the patient encounter. Improve accuracy in patient billing. Optimize your technology and training investments. ZNF offers free HL7 interfaces to move information to and from your EMR, EHR, or PACS system. If your system does not support HL7, ZNF offers customized interface options. The ease of EMR transcription permits your clinicians to move quickly, efficiently, and thoroughly through documentation of the patient encounter, even as the requirements of use and detail increase under ICD-10 coding and Meaningful Use, Stage 2. Regardless of which system you use, the simple fact is that we speak 7-10 times faster than we enter data manually. Choosing to use a professional medical transcription company in conjunction with your EMR or EHR means faster, improved documentation. Better documentation yields better care, more accurate billing, and faster collections. Contact ZNF Medical Transcription today to learn more about our services, free HL7 interfaces, and EMR transcription integration. ZNF is a US-based medical transcription company that has been serving doctors and physicians practices for more than 30 years. We deliver quality transcription and place a priority on excellent customer care. © 2019 ZNFMT. All Rights Reserved.